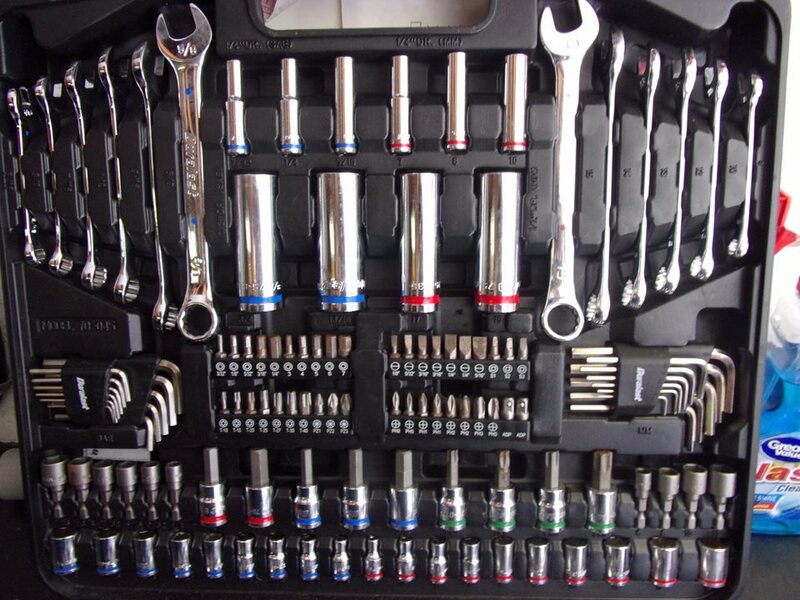 Everytime I get something out of my toolbox, I can't help myself but ask myself "Have I ever done what's inside my toolbox?" Since I'm actually doing this, I also had to reorganize my toolbox as well to make it even easier to navigate to find what I need. Well, here it is, I'm actually now doing it for the first time. 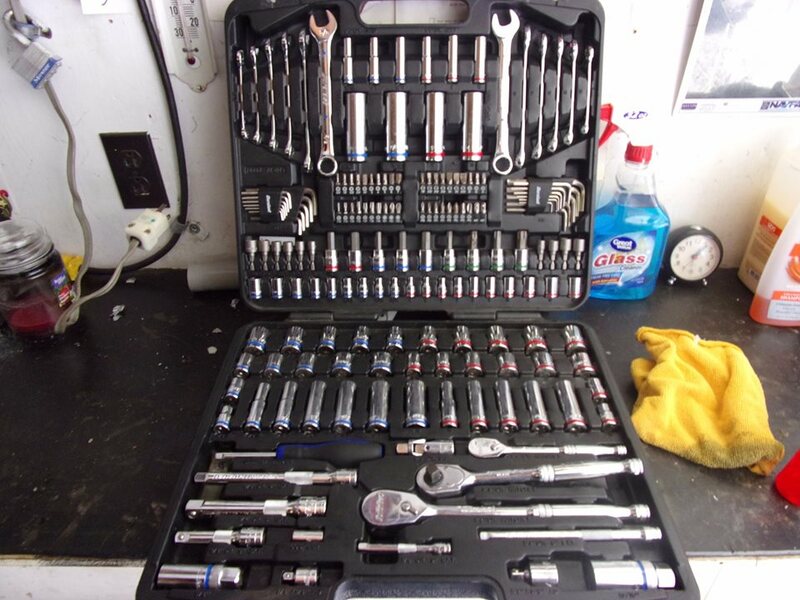 Duralast 180 piece tool kit, from 1/4 to 3/8ths and to 1/2 inch sockets, ratchets, wrenches, and a spinner handle set, I got the right tools for the right job. It's always been my favorite thing inside my toolbox, once I open my toolbox, I just grab the handle and tote it around with me where ever I go, it's not only useful for my truck, but also at work and around the house as well. 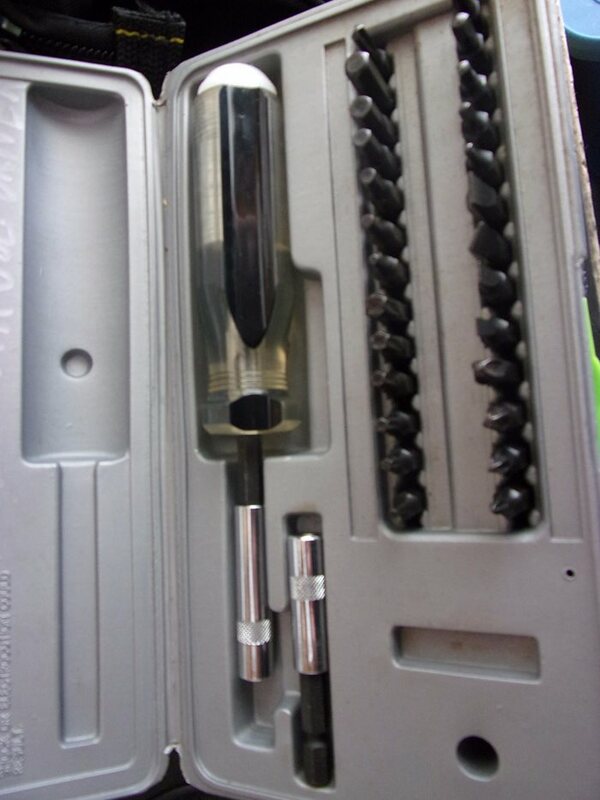 screwdriver bits, allen keys, socket wrench bits, and wrenches is there in case if I need them. The best thing about the Duralast tools that if a socket or a wrench ever breaks, I can drive right down the street and trade in the old broken tool for a new one. 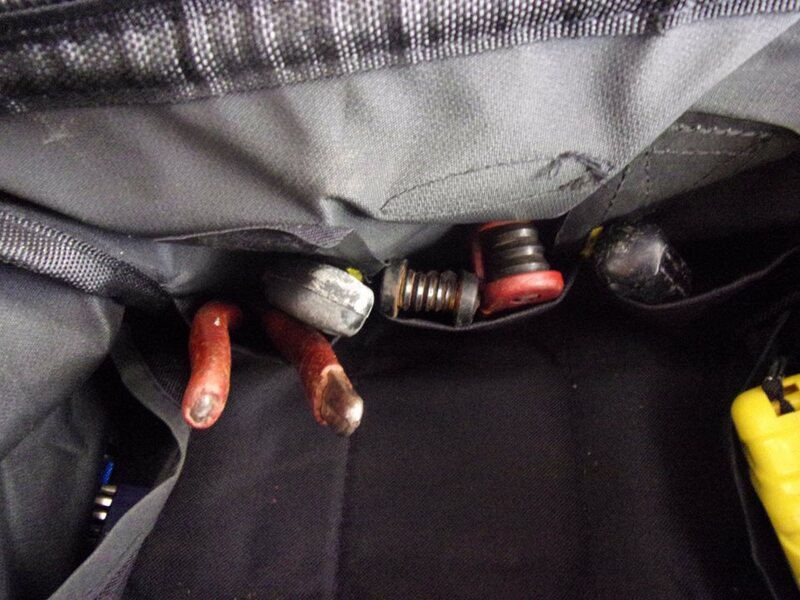 Next is my toolbag, there some small tools that I keep inside as well. 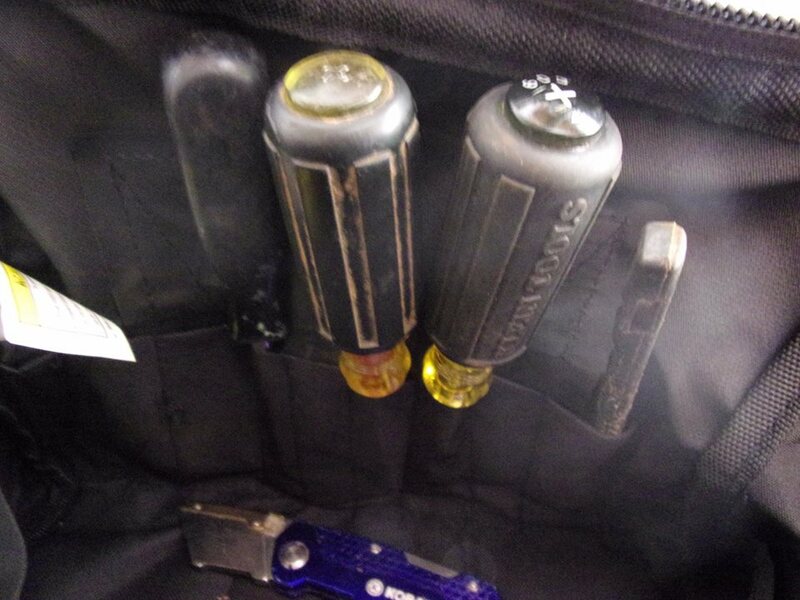 This is my quarter inch set, which always stays in my tool bag, also another set that also stays inside is my multipurpose spinner handle set. I also got some small tools like allen keys, screwdrivers, box cutters, pliers, and even a pair of side cutters. 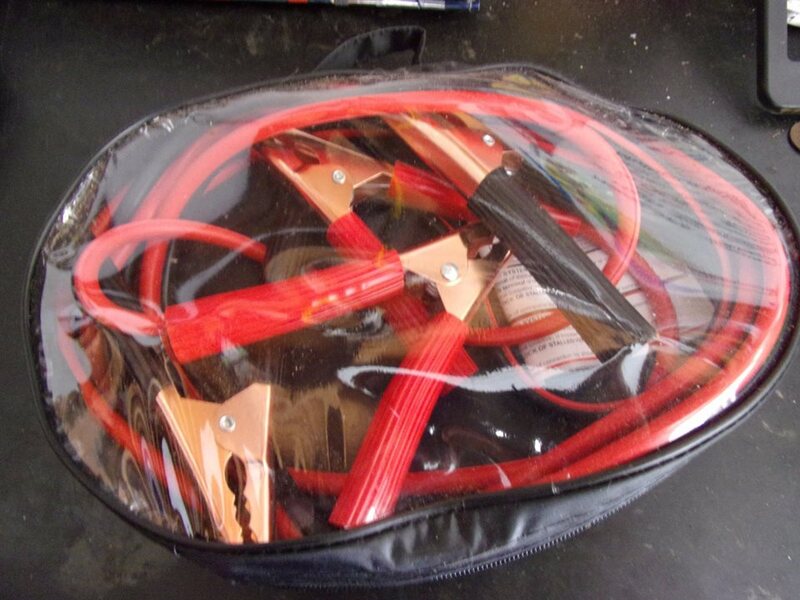 Next is the interior of my toolbox, this is some stuff that I keep inside in case if I need them or extras in case if one of my sockets or wrenches fail. My messy top tray for my toolbox. 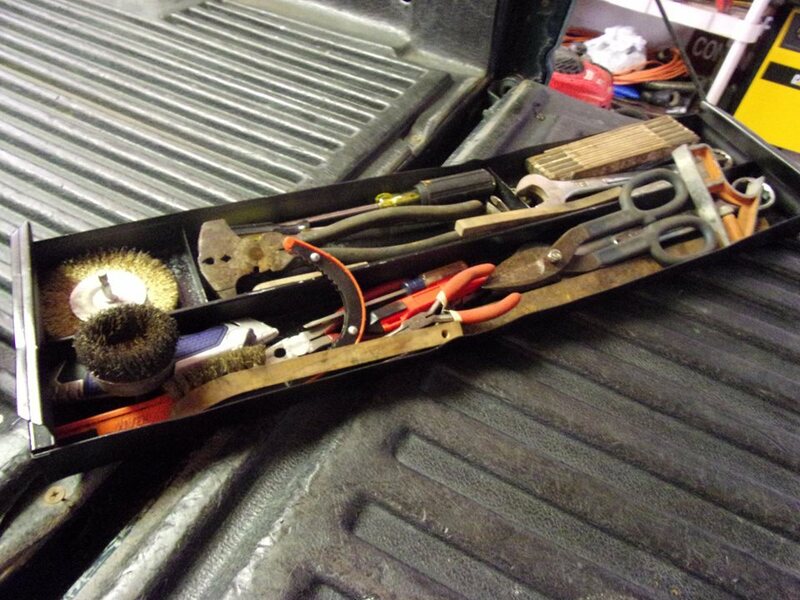 My top tray is just clutter from pliers, screwdrivers, wire brushes, and even a few oil filter wrenches are included. My favorite tool is my breaker bar, this helps me get stuck nuts and bolts off so that way it's easier to undo them with a socket wrench. 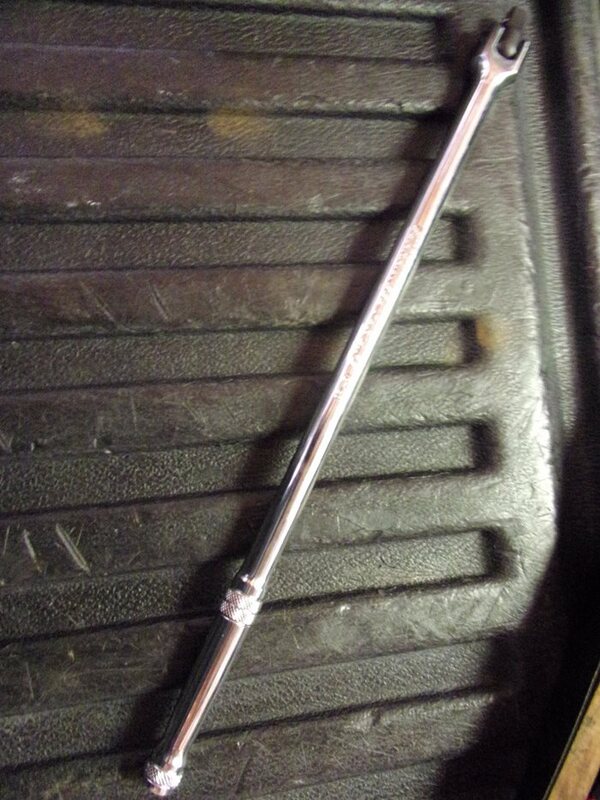 Ironically, I broke a breaker bar, so that's the reason why this one looks a little newer than the one that I had. 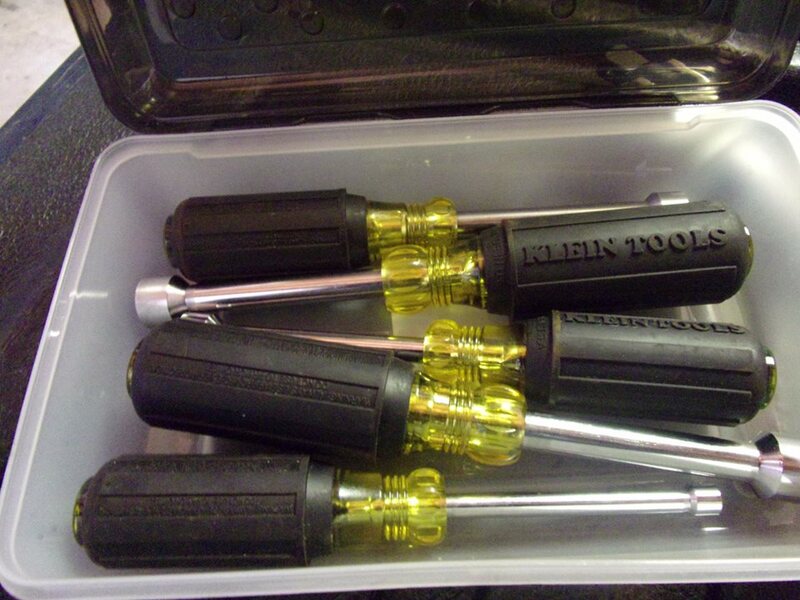 Klien tools may be pricey, but sure beats Snap-On. 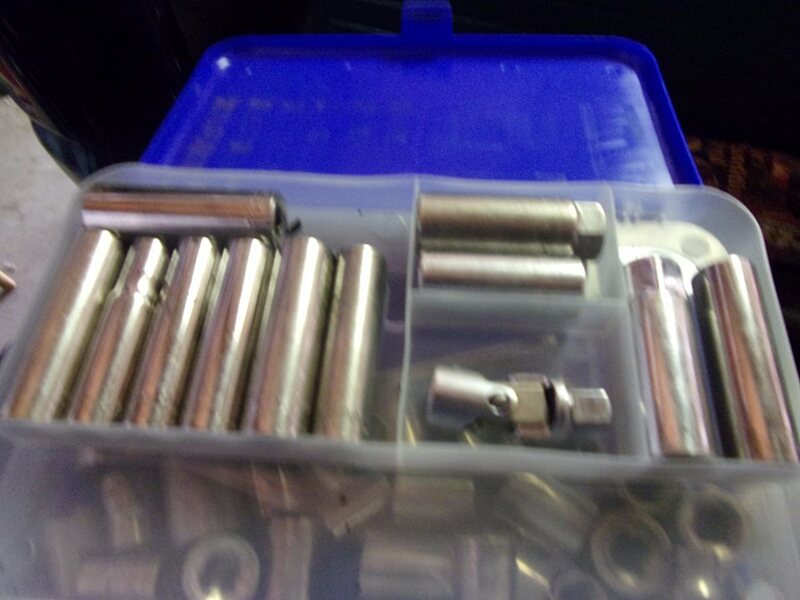 Another set I have are these nut drivers, they are helpful with clamps, but a socket wrench just does the same job. 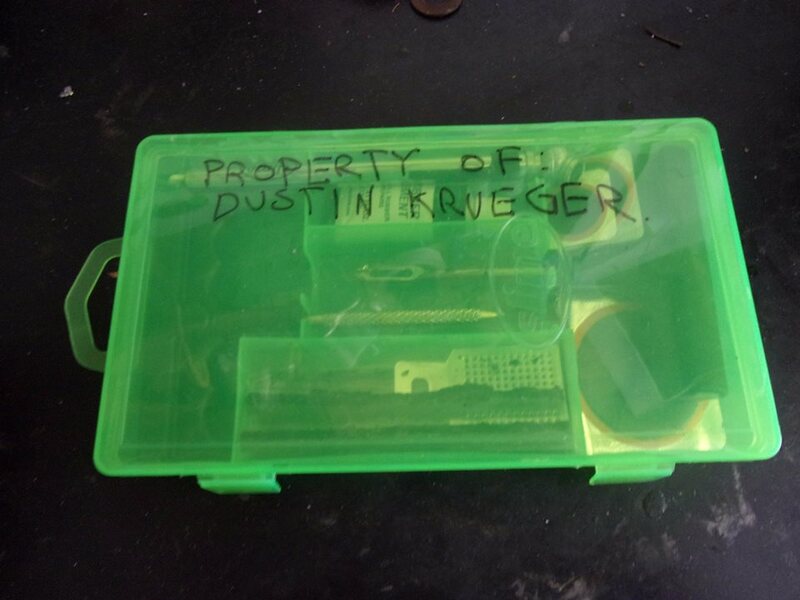 I also keep a pencil boxes of wrenches inside. Pencil boxes are cheaper to use, they only cost 97 cents at Wal-Mart, so it's useful for easy storage and easy room inside my toolbox. 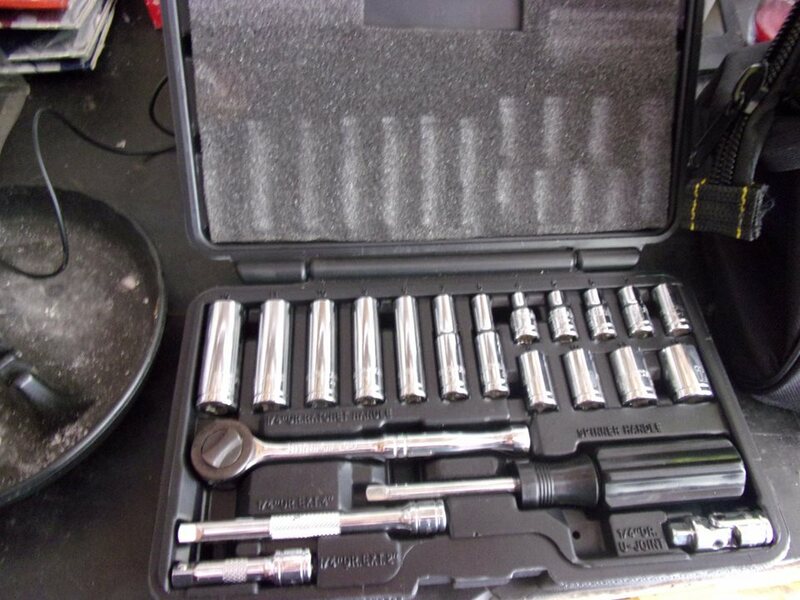 My 3/8ths socket set from Craftsman, it includes a few deep sockets, a universal joint socket for those hard to reach nuts and bolts, and shallow sockets, it may be messy, but I try my best to keep myself organized. The pencil boxes for these 3 tools were actually my sister's idea, I told her I want to organize up my toolbox and she brought up the idea of using pencil boxes for easy storage. The ones for the nut drivers and the wrenches only cost me 97 cents, the double side for the 3/8th sockets actually cost me a little extra. 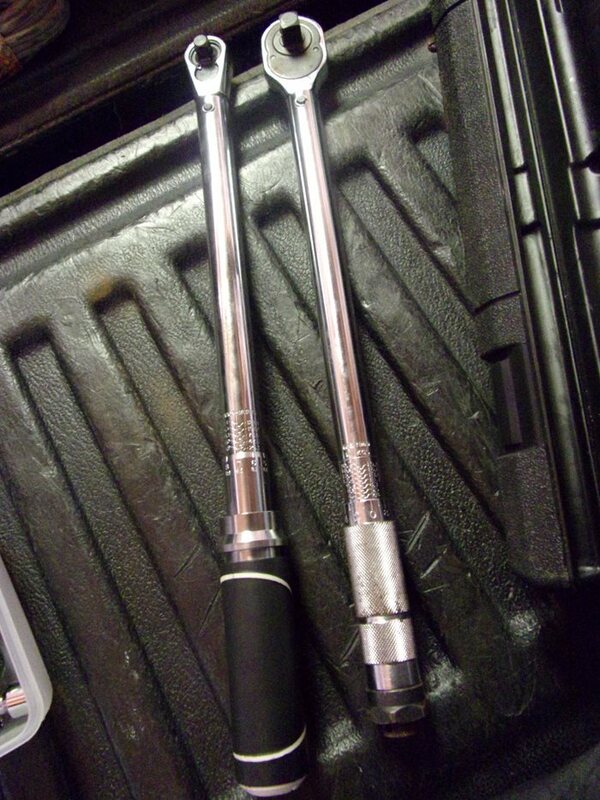 Finally, from my toolbox are torque wrenches, I got a half inch drive and a 3/8ths drive, the half inch drive goes up to 150 ft-lbs of torque while the 3/8ths go up to 100 ft-lbs of torque. 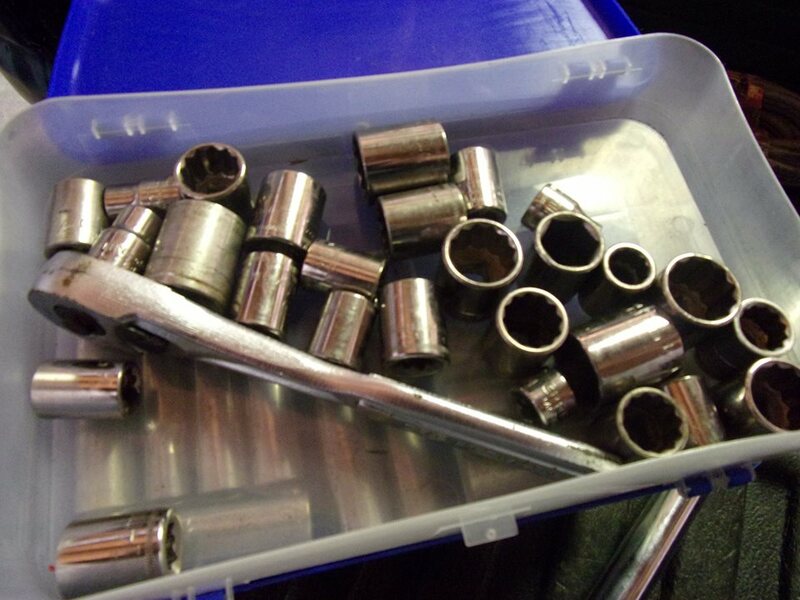 One of these days I'll get the quarter inch torque wrench for smaller nuts and bolts. 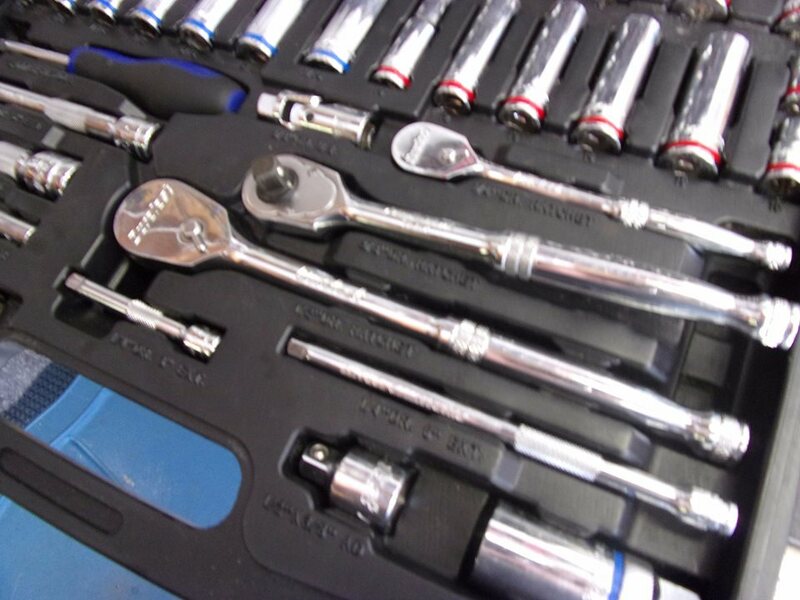 The half inch drive is useful for tightening down lugnuts and axle nuts while the 3/8ths drive torque wrench is useful for suspension, brake, and even engine work as well. Inside the cab of my truck, I have myself a little survival kit. You can get one of these at Wal-Mart for 8 bucks for the full kit. All except for the rubber cement, there's a kit separate that repairs flat tires for bicycles, ride mowers, etc. 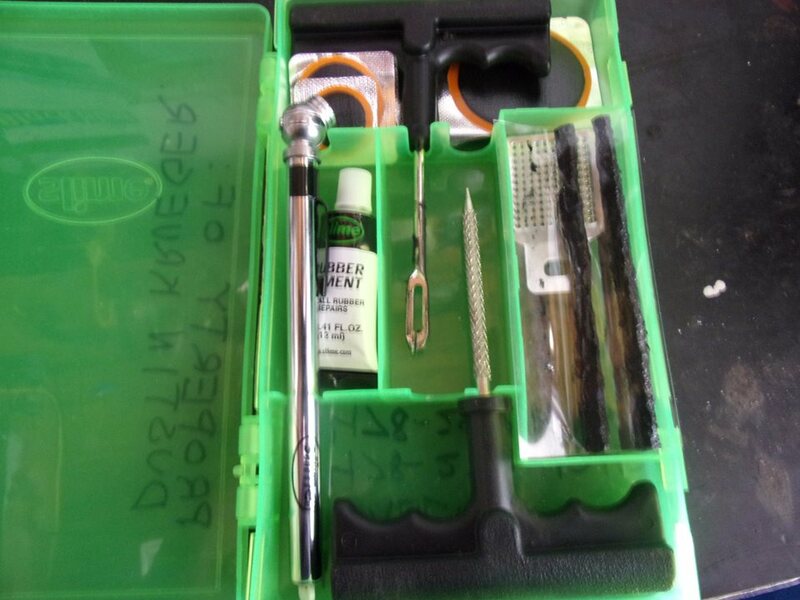 Next is a flat tire repair kit, don't say a flat tire will never happen to you, but one day, it will happen, this kit has everything you need to get yourself back out on the road and get yourself to a local tire repair shop. 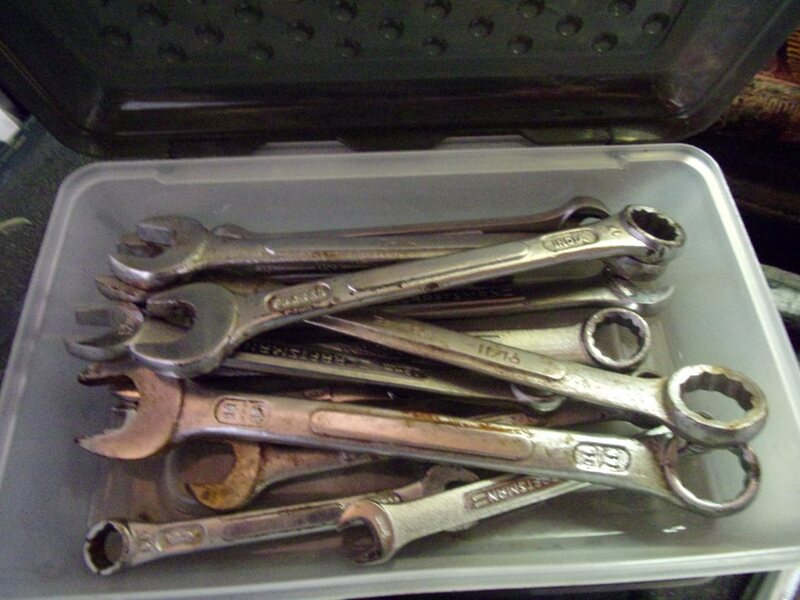 Finally, these are the tools that I keep inside the garage, but never took with me. The only reason why because they serve me as diagnose or lifting tools. 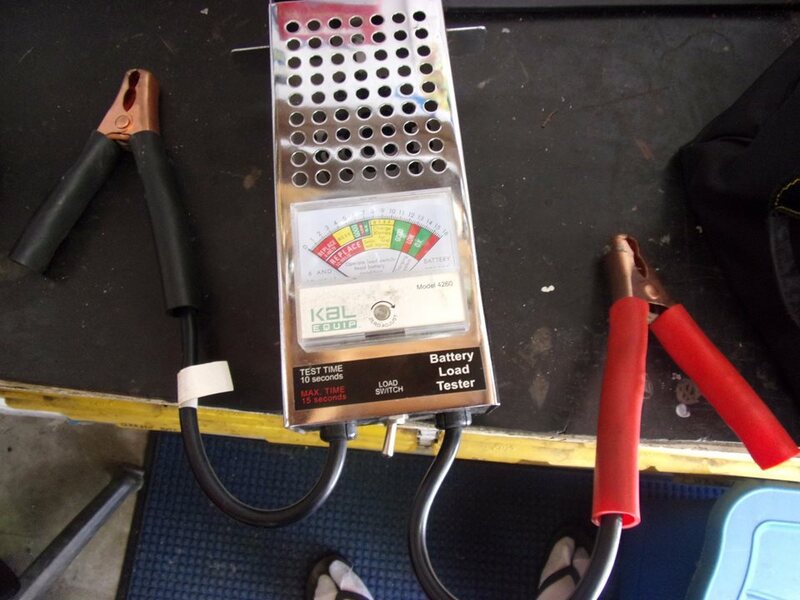 Battery load tester. It's useful to test your battery before you go buy a new one or have to charge up your old one. First is a battery load tester, even though some parts stores do it for free, this is actually helpful to tell you if your battery needs to be replaced or recharged, and it's 100% fully accurate. Another favorite not pictured here is a On Board Diagnose scanner, which scans the computer everytime there's a "Check Engine" light. Just like battery tester, the OBD scanner scans the computer for any faults in the computer and display in codes. I may have a few codes pop up, but that is no issue. 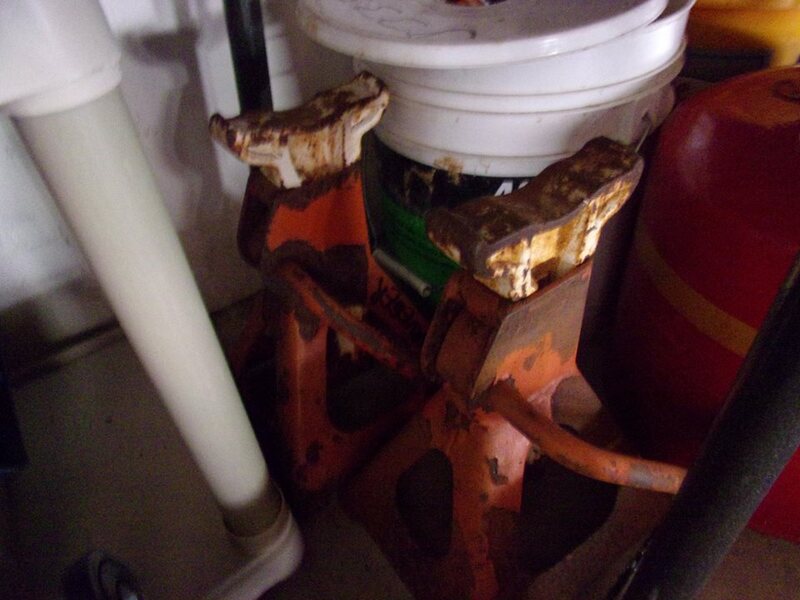 These jack stands were here when we moved in, I'm thinking about sanding it down to remove the rust and the old paint and give them a glossy blue finish to match with my Duralast hydraulic jack. My Duralast 3 ton hydraulic jack. My mom flipped out about this tool, but to be honest, I say it's the best thing to buy. 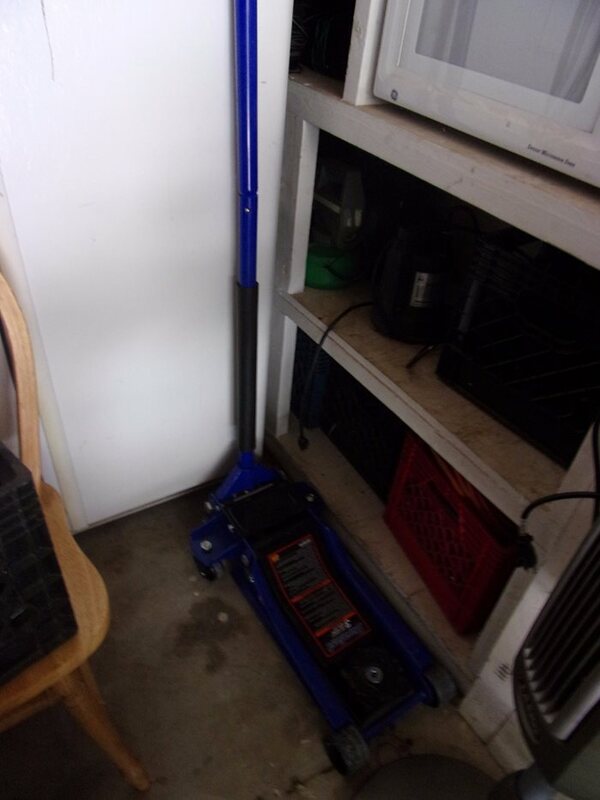 Next are a pair of jack stands and a 3 and a 1/2 ton jack, I keep these inside the garage in case if I have to go underneath the vehicle, the jack stands are useful to keep the vehicle in the air, you never want to rely on the jack to keep the vehicle in the air. There are some that I forgot, but will add in later on. Like a battery powered light from DeWalt, battery powered reciprocating saw (street name: sawzall), Milwaukee electric impact gun, but I believe that may be it. Any Van Brothers and Sisters out there??? Chevy or GMC only!!! Let me know and show me yo van!! !